Announcing two more Suds and Cinema movies! This year, we've been taking our Suds and Cinema series on the road, exploring different venues around the city in which we could watch a movie — usually a ridiculous movie, but sometimes one with more meat on its bones — and then, of course, drink local beer. We've secured two more dates for Suds screenings, and they are as follows, dear readers. On Thursday, Aug 18, we are bringing you a movie under the stars in Olmstead Park in Kendall Yards (it's the big open grass space at the west side of the neighborhood). We'll have a beer and cider garden for those with an ID, but the event will be all ages. The movie, you ask? 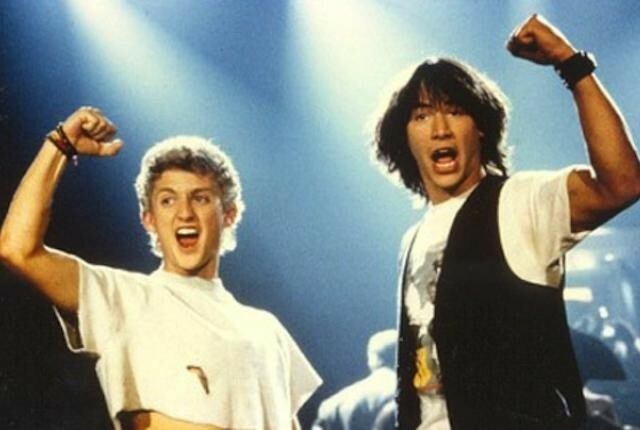 Uh, how about Bill and Ted's Excellent Adventure? Widely considered one of the most accurate depictions of time travel in cinema, Bill and Ted's goes well with local beer and a warm evening. We're partnering with Friends of the Centennial Trail for this event, and they'll benefit from the $5 suggested donation for your attendance. The fun and beer starts at 7 pm and the movie begins when it gets dark...so like 8:30 pm that time of year. Should it rain that day, we'll reschedule for the following evening — Fri, August 19. Then, on Thursday, Oct. 20, we're hosting our third annual Little Lebowski Urban Achievers Banquet and Awards Ceremony. Yes, this is The Big Lebowski — and we're doing it at the gorgeous Riverside Place (formerly know as the Spokane Masonic Temple). As in previous years, we'll have a costume contest and other fun. This time, we'll also be serving White Russians. We'll start that one at 7:30 pm and get the movie rolling around 8 pm, dude. Stay tuned. We'll be announcing more about both of these events, including participating breweries, in the near future. We'll let you know of any additional Suds and Cinema events as we schedule them.